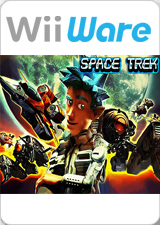 Space Trek: as Captain Jay, you take control of a space jet deployed on an alien world. The planet you're on is inhabited by the Knagar, a race of big, green, self important bullies. You must fight your way through, outsmart them and save the survivors. Fortunately Jay is always there to throw a nice punchline when things get ugly. Fight floating drones, destroy Knagar ships, attack turrets, and deal with gigantic worms before they swallow your ship or electrocute you. Access your handy map and don't get lost on one of six big levels, pick up keycards, deactivate forcefields, save survivors and collect powerups. Rearm your ship to use one of six weapons such as the Quark Dispeller, Anti-Matter Thrower, or maybe Mega Rockets? Recharge your ship's battery by flying over heat-bursting volcanoes. Then use the surplus to power your weapons or energy shield. Finally, enjoy humorous dialog that accompanies the player throughout the game. The graph below charts the compatibility with Space Trek since Dolphin's 2.0 release, listing revisions only where a compatibility change occurred. This page was last edited on 15 January 2018, at 05:05.